A FINE RING FROM CROYDON FOUNDRY. The recast ring of eight bells at St. Lawrence’s Church, Alton, Hants, were reopened by members of the Winchester Diocesan Guild on Saturday May 1st. Members present included Mr. G. Williams (Master) and Mr. G. Pullinger (general sec. ), and about 30 ringers from Aldershot, Bishopstoke, Bishop’s Sutton, Farnham, Guildford, North Stoneham, Seale, Wickham, Winchester and the local band. A very welcome visitor was Mr. J. H. Shepherd, of Swindon, complete with notebook and rule. All the bells have been recast and hung in a new iron H. frame, on ball bearings, with new and modern fittings. The work has been carried out by Messrs. Gillett and Johnston in their customary excellent manner, and gave every satisfaction. The weight of the tenor is 18 cwt. 1 qr. 20 lbs. in E., and the total weight of the peal is 74 cwt. 15 lbs. The general opinion was that Alton now possesses an exceptionally fine ring of bells. The reopening service was conducted by the Rev. C. E. Matthews, R.D. (vice-president) and the Guild form of service used. He gave a most interesting address on the origin and meaning of the use of bells, and the history of change ringing down to the present time. There was a large congregation present. The ringers sat down to a sumptuous meat tea, provided by the generosity of Mr. H. P. Birrell (churchwarden). The Rev. F. R. Dawson (Vicar) presided, and was supported by Mr. H. P. Birrell, Mr. Bond, Dr. Leslie (churchwardens), Rev. C. E. Matthews and Mr. Cyril Johnston. Following tea speeches were made by the gentleman mentioned, and Mr. G. Williams, in reply, voiced the thanks and appreciation of the ringers. Afterwards a move was made to the tower, and ringing enjoyed up to 8 p.m., the methods rung being Grandsire and Stedman Triples, Bob, Kent Treble Bob, Cambridge and London Surprise Major. It is interesting to note that change ringing has been practised in Alton from an early date, and two peal boards record that peals of Grandsire Triples were rung on the bells on March 7th, 1777 and on February 15th, 1785. It is believed that the former was the first peal rung in the county. William Dyer, who was a subscriber to ‘The Clavis,’ took part in both these peals, and his descendants, who still reside in Alton, subscribed towards the work just completed. For evening service on Sunday, May 2nd, 1,260 Stedman Triples in 48 mins. : H. Perry 1, G. Pullinger 2, V. Lowton 3, G. Noakes 4, E. Ham 5, A. Evans 6, A. Hardiman (conductor) 7, H. Sutton 8. WHEN THE BELLS ring out from the tower of St. Lawrence Church, Alton, they resound over ground which is rich in English history. For the Hampshire town of Alton is old. Indeed, it was among the oldest of primitive Wessex towns, and there was probably a township there as early as the sixth century. Its boundaries were clearly defined in 825 A.D., for in that year King Egbert, who was the first to rule from Wessex to Northumbria, bestowed on the old Minster at Winchester “fifteen hides in a place commonly called Aeweltune by the inhabitants.” Three fierce encounters are recorded in Alton between Saxons and Danes, and an event of national importance took place there when Henry I and his brother, Robert of Normandy, signed a treaty by which the latter agreed to relinquish the throne of England on receipt of 3,000 marks annually. Canterbury Pilgrims, who had landed at Southampton, passed through the town on their way to Farnham. It was in the Church of St. Lawrence, a church situated on high ground 360 feet above sea level, that an event took place in 1643 which was to make it famous. The River Wey rises in the meadows half a mile outside the town, and at one time its flow of water must have been terrific, for a paper mill, three other mills and a number of tanyards thrived on its banks. Alton was a prolific hop-growing area, and with the hops came the breweries and the popular “Alton Ales.” Now, very little brewing is done in the town, and the paper mills, established in Alton in the 1700’s, moved to Eynsford in 1908. The poet Edmund Spenser lived in a cottage a couple of hundred yards from the church in the 1500’s, and Cardinal Newman at one time lived in the town. William Curtis, well known as a botanist, resided in Alton, and the local museum bears his name. Alton’s link with a tragedy was from the murder of young Fanny Adams not far from Alton Church in 1847. The phrase “Sweet Fanny Adams” is heard throughout the world. “Progress” has taken much of the peace and quietness away from this market town. Amery Farm, which adjoined the church, no longer exists as such. Alton is now a commuter area, London being but 48 miles distant. 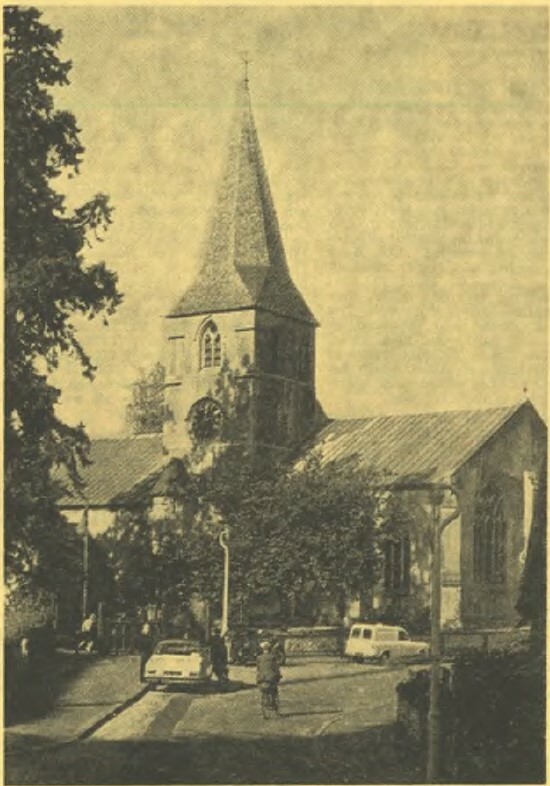 St. Lawrence Church is the old Parish Church, and is celebrating its 900th anniversary throughout 1970. There is a comprehensive programme throughout the year, including a Flower Festival this month and Son et Lumiere in September, and the bellringers are playing a conspicuous part. The Bellringing Festival is on July 18 and ringers from all areas are taking part. No exact date can be found as to when bells were first hung in the tower. The earliest record is in churchwardens’ accounts of 1625. A ring of five is known to have existed and in 1742 it is recorded that a tenor bell was cast to make a ring of six. The treble was recast at the same time. Known details of this ring are:- Treble, 8 cwt. 25 lb. (recast 1742); tenor, 22 cwt. 26 lb., in F (cast 1742 by Thomas Lister); 5th, 15 cwt. 1 qr. 24 lb. (recast 1754). One peal is recorded on these bells, Grandsire Doubles, 1777, and the board lists two men as ringing the tenor - which was unusual for a bell of this weight. The year 1785 saw the recasting of the six and the addition of two trebles. The treble was recast in 1803 and when, in 1889, the 7th became cracked, this was recast and the others rehung. Inscriptions on the bells at this time were:- Treble, Thomas Janaway of London Fecit 1803, 6 cwt., note E. 2nd: Thomas Janaway Fecit, 1785, 6½ cwt., D sharp. 3rd: Thomas Janaway Fecit, 1785, 7 cwt., C sharp. 4th: Thomas Janaway Fecit, 1785, 8 cwt., B. 5th: “When from the earth our notes rebound, the hills and valeys echo round”; Thomas Janaway, 1785, 10 cwt., A. 6th: Thomas Janaway of Chelsea made us all, 1785; “Musica Est Mentis Medicina,” 11 cwt., G sharp. 7th: Thomas Janaway Fecit, 1785, 13¾ cwt., F sharp. Recast by Mears and Stainbank 1889. Tenor: “Rev. Dr. Thomas Balguy, Vicar. James Dicker, Richard Palmer Baker, John Phillips, Churchwardens.” Thomas Janaway Fecit 1785, 20 cwt., E. (Estimated weight by Gillett and Johnston in 1925 22 cwt.). Twelve peals are recorded as being rung on these bells. The tenor was found to be seriously cracked in 1925. The bells were removed to Gillett and Johnston’s foundry and the other bells were found to be chipped and out of tune. It was decided to recast all the bells and hang them in a modern steel frame on ball bearings. This work was completed for Easter Sunday, 1926. To date 12 peals have been rung on this ring- a total of 32 in all. Of the present-day ring, the treble is 4 cwt. 3 qr. 10 lb, and the tenor 18 cwt. 1 qr. 20 lb. There is not a finer sound to be heard on a frosty winter’s night or a sunny evening in summer as one stands on the hills around Alton listening to the church bells. They bring a sense of peace and tranquillity, of which there is all too little in the world today.